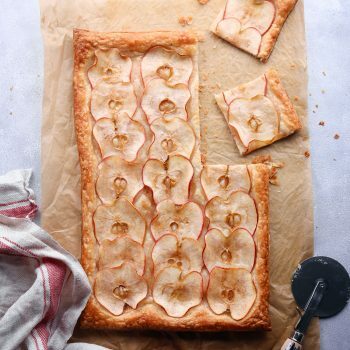 This easy apple tart has only 5 ingredients, is vegan friendly and free of dairy, eggs, and refined sugar. Using a sheet of puff pastry makes this dessert a cinch to throw together! Preheat oven to 375ºF. Gently unfold thawed pastry and place on a large sheet of parchment paper . Roll pastry an inch or two larger and place overlapping apples slices all over pastry, leaving a one-inch border around the apples. Be generous with the apple slices for better flavor. In a small bowl, mix together me melted butter, maple syrup/sugar, and cinnamon until well combined. Using a pastry brush, generously brush butter-cinnamon mixture all across the apples and puff pastry. Transfer parchment paper with apple tart to a baking sheet and place into the oven. Bake for 30–35 minutes, until pastry is golden brown and apples are tender. Remove from the oven and let cool before slicing. Makes 8–12 squares, depending on how large you slice them.